In letter, leading European figures demand EU's Mogherini reject Trump peace plan, claim plan would 'severely compound' previous failures. Former European officials, including former prime ministers and foreign ministers, called on the European Union to reject US President Donald Trump's proposed Israel-Palestinian Authority (PA) peace plan, The Guardian reported. According to the official's, Trump's "deal of the century" is one-sided and biased against the PA.
On Sunday, a source familiar with the plan told The Washington Post that practical improvements in the lives of Palestinian Arabs but is likely to stop short of ensuring a separate, fully sovereign Palestinian state. 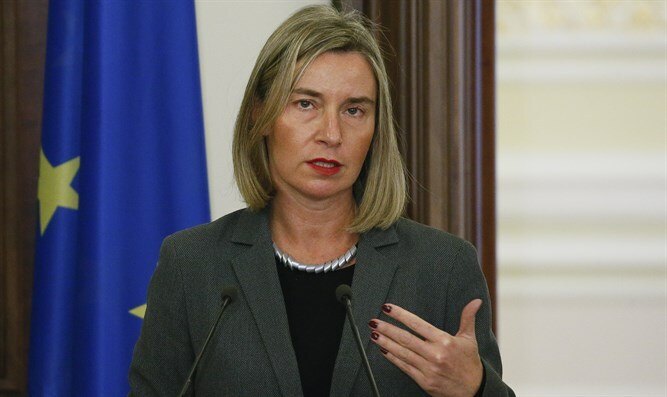 The Guardian quoted the officials' letter, which was sent Sunday to European Union High Representative of the European Union for Foreign Affairs Federica Mogherini: "It is time for Europe to stand by our principled parameters for peace in Israel-Palestine." "Unfortunately, the current US administration has departed from longstanding US policy," recognizing "only one side's claims to Jerusalem" and showing "a disturbing indifference to Israeli settlement expansion" in Judea and Samaria. Europe must "be vigilant and act strategically," the letter emphasized, adding that Europe may have to "pursue its own course of action." "We] are convinced that a plan that reduces Palestinian statehood to an entity devoid of sovereignty, territorial contiguity and economic viability would severely compound the failure of previous peacemaking efforts, accelerate the demise of the two-state option and fatally damage the cause of a durable peace for Palestinians and Israelis alike." Its signatories included former French PM Jean Marc Ayrault, former Swedish PM Carl Bildt, former Polish PM Włodzimierz Cimoszewicz, former Italian PM Massimo D’Alema, former Belgian PM Guy Verhofstadt, and former Romanian PM Dacian Cioloș. Former NATO secretary generals Willy Claes and Javier Solana, former Irish president Mary Robinson, and former UK foreign secretaries David Miliband and Jack Straw also signed the letter.